Geert Wilders (Dutch: [ˈɣeːrt ˈʋɪldərs]; born 6 September 1963) is a Dutch politician who has been leader of the Party for Freedom (Partij voor de Vrijheid – PVV) since he founded it in 2006. Wilders is the parliamentary leader of his party in the House of Representatives (Tweede Kamer). In the 2010 formation of the Rutte cabinet, a minority cabinet of VVD and CDA, he actively participated in the negotiations, resulting in a "support agreement" (gedoogakkoord) between the PVV and these parties, but withdrew his support in April 2012, citing disagreements with the cabinet on proposed budget cuts. Wilders is best known for his criticism of Islam; his views have made him a controversial figure in the Netherlands and abroad, and since 2004 he has been protected at all times by armed bodyguards. Raised a Roman Catholic, Wilders left the church at his coming of age. His travels to Israel and the greater Middle East as a young adult helped form his political views. Wilders worked as a speechwriter for the conservative-liberal People's Party for Freedom and Democracy (Volkspartij voor Vrijheid en Democratie – VVD), and later served as parliamentary assistant to party leader Frits Bolkestein from 1990 to 1998. He was elected to the municipal council of Utrecht in 1997, and one year later to the House of Representatives. Citing irreconcilable differences over the party's position on the accession of Turkey to the European Union, he left the VVD in 2004 to form his own party, the Party for Freedom. Wilders has campaigned to stop what he views as the "Islamisation of the Netherlands". He has compared the Quran to Mein Kampf and has campaigned to have the book banned in the Netherlands. He advocates ending immigration from Muslim countries, and supports banning the construction of new mosques. Wilders was a speaker at the Facing Jihad Conference held in Israel in 2008, which discussed the dangers of jihad, and has called for a hard line against what he called "street terror" exerted by minorities in Dutch cities. His controversial 2008 film featuring his views on Islam, Fitna, received international attention and extreme criticism. His party was also sued due to content being used in his film without permission. He has been described in the media as populist and labeled far-right, although this is disputed by other observers. Wilders, who long refused to align himself with European far-right leaders such as Jean-Marie Le Pen and Jörg Haider and expressed concern about being "linked with the wrong rightist fascist groups", views himself as a right-wing liberal. More recently, however, Wilders worked together with the French National Front's Marine Le Pen in an initially ill-fated, but eventually successful attempt to form a parliamentary group in the European Parliament which now includes parties from nine countries, among them Austria's Freedom Party, Italy's Northern League, and Belgium's Flemish Interest. Geert Wilders has been charged in relation to incitement multiple times. Wilders was first accused of criminally insulting religious and ethnic groups and inciting hatred and discrimination. He was found not guilty in June 2011. In 2016, he landed in court again and was found guilty of incitement and encouraging discrimination against Moroccans, but faced no punishment. Wilders started off his political development under his mentor, Frits Bolkestein. Wilders was born in the city of Venlo, in the province of Limburg. He is the youngest of four children, and was raised Catholic. He was born to a Dutch father and a mother born in colonial Indonesia, whose background was mixed Dutch and Indonesian. His father worked as a manager for the printing and copying manufacturing company Océ, and had hidden from the Germans during the Second World War, an experience so traumatizing that he refused to physically enter Germany even forty years later. Wilders received his secondary education at the Mavo and Havo middle school and high school in Venlo. Reflecting passions that came to the fore later in his career, Wilders took a course in health insurance at the Stichting Opleiding Sociale Verzekeringen in Amsterdam and earned several law certificates at the Dutch Open University. Wilders' goal after he graduated from secondary school was to see the world. Because he did not have enough money to travel to Australia, his preferred destination, he went to Israel instead and volunteered for a year moshav Tomer on the West Bank. With the money he saved, he travelled to the neighbouring Arab countries, and was moved by the lack of democracy in the region, due to the conflicts at the time. When he returned to the Netherlands, he retained Israeli ideas about counter-terrorism and a "special feeling of solidarity" for the country. Living in Utrecht, Wilders initially worked in the health insurance industry. His interest in the subject led him into politics as a speech-writer for the Netherlands' People's Party for Freedom and Democracy. He started his formal political career as a parliamentary assistant to the party leader Frits Bolkestein, specialising in foreign policy. He held this job from 1990 to 1998. During this time Geert Wilders travelled extensively, visiting countries all across the Middle East, including Iran, Syria, Jordan, Egypt and Israel. Bolkestein was the first Dutch politician to address the consequences of mass immigration for Dutch society, including a sharp criticism of Muslim immigrants. He set an example for Wilders not only in his ideas but also in his confrontational speaking style. Political analyst Anno Bunnik later described Wilders as a "sorcerer's apprentice" to Bolkestein. On 10 November 2004, two suspected attackers were captured after an hour-long siege of a building in The Hague. They were in possession of three grenades and were accused of planning to murder Wilders as well as a fellow MP, Ayaan Hirsi Ali. The suspects were presumed to be members of what the Dutch intelligence agency, the General Intelligence and Security Service, has termed the Hofstad Network (Hofstadgroep). Since this incident Wilders has been under constant security protection because of frequent threats to his life. In September 2007, a Dutch woman was sentenced to a one-year prison term for sending more than 100 threatening emails to Wilders. In 2009, a rapper from Rotterdam was sentenced to 80 hours community service and a two-month suspended jail term for threatening Wilders in a rap song. Wilders was listed as the most threatened politician in the Netherlands in 2008. Wilders is said to have been "deprived... of a personal life for his... hatred of Islam". He is constantly accompanied by a permanent security detail of about six plainclothes police officers, and does not receive visitors unless they are cleared in advance, thoroughly searched, and escorted at all times. He lives in a state-provided safe house which is outfitted to be bulletproof, is heavily guarded by police, and has a panic room. He is driven from his home to his offices in parliament in an armored police vehicle, and wears a bulletproof vest. His office is located in the most isolated corner of the Dutch Parliament building, and was chosen because potential terrorists can get to it through only one corridor, making it easier for his bodyguards to repel an attack. He is married to Krisztina Wilders (née Marfai), a former diplomat of Hungarian origin, with whom he can only meet about once every week due to security concerns. The restrictions on his life because of this, he said, are "a situation that I wouldn't wish on my worst enemy". In January 2010, Karen Geurtsen, a Dutch journalist from the magazine HP-De Tijd, revealed a painful breach of security. She spent four months working undercover, posing as an intern, for the PVV party. She claimed that she had had unchecked access to Wilders. "I could have killed him", were the first words of the article that she published about this operation. According to her, she had "dozens" of opportunities to take his life. In July 2010, after Wilders complained that his security was inadequate, the Special Security Assignments Brigade, a special unit of Dutch military police, made four attempts to smuggle a firearm into the heavily guarded offices of Wilders' Freedom Party, two of which were successful. Following these breaches, security at the offices was increased. In June 2011, disclosure of Wilder's personal finances indicated that he had founded a self-administered company one year earlier without reporting this via the public records of the House of Representatives, which he, as a parliamentarian, should have done. Wilders has been dying his hair since at least the mid 1990s having previously gotten his hair cut at a barber shop near Utrecht Central Station until this was stopped due to security concerns. As a result of aging, Wilders' dark roots no longer show up due to increased graying. Wilders has acquired nicknames such as "Mozart" and "Captain Peroxide" because of his flamboyant platinum blond hairstyle. Radio Netherlands calls him "the most famous bleach-blond since Marilyn Monroe". Wilders is an agnostic, but he has stated that he thinks Christians "are my allies" and that they fundamentally should want the same thing. 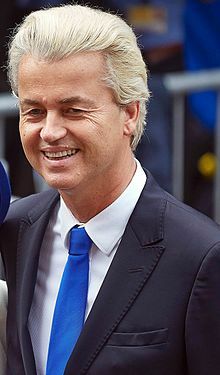 In 1997, Wilders was elected for the People's Party for Freedom and Democracy (VVD) to the municipal council of Utrecht, the fourth largest city of the Netherlands. He lived in Kanaleneiland, a suburb with cheap social housing and high apartment blocks, which has a relatively high number of immigrants. While a city councilor, Wilders was mugged in his own neighbourhood; some have speculated that this may have catalysed his political transformation. He was not rewarded for his time on the municipal council of Utrecht, for in the following elections he would score well below the national average in the University city. A year later, he was elected to the Netherlands' national parliament, but his first four years in parliament drew little attention. However, his appointment in 2002 as a public spokesman for the VVD led Wilders to become more well known for his outspoken criticism of Islamic extremism. Tensions immediately developed within the party, as Wilders found himself to be to the right of most members, and challenged the party line in his public statements. He was expelled from the VVD parliamentary party, and in September 2004, Wilders left the VVD, having been a member since 1989, to form his own political party, Groep Wilders, later renamed the Party for Freedom. The crunch issue with the VVD party line was about his refusal to endorse the party's position that European Union accession negotiations must be started with Turkey. The Party for Freedom's political platform often overlaps those of the assassinated Rotterdam politician Pim Fortuyn and his Pim Fortuyn List. After his death, Fortuyn's impact remained, as more and more politicians sought to gain political mileage by directly confronting topics such as a ban on immigration that were, from a politically correct point of view, considered unmentionable in the Netherlands until Fortuyn came on the scene and upended the Dutch tradition of consensus politics with an anti-immigration stance. Wilders would position himself to inherit Fortuyn's constituency. The Party for Freedom called for a €16 billion tax reduction, a far stricter policy toward recreational drug use, investing more in roads and other infrastructure, building nuclear power plants and including animal rights in the Dutch constitution. In the 2006 Dutch parliamentary election, their first parliamentary election, the Party for Freedom won 9 out of the 150 open seats. In March 2009, in a party meeting in Venlo, Wilders said "I want to be prime minister", believing the PVV will eventually become the Netherlands' biggest party. "At some point it's going to happen and then it will be a big honour to fulfil the post of prime minister". Polling conducted throughout March 2009 by Maurice de Hond indicated the Party for Freedom was the most popular parliamentary party. The polls predicted that the party would take 21% of the national vote, winning 32 out of 150 seats in the Dutch parliament. If the polling results were replicated in an election, Wilders would be a major power broker. Under such circumstances, there would also be some likelihood of him becoming Prime Minister of the Netherlands. This has been partially attributed to timely prosecution attempts against him for hate speech and the travel ban imposed on him by the United Kingdom, as well as dissatisfaction with the Dutch government's response to the global financial crisis of 2008–2009. 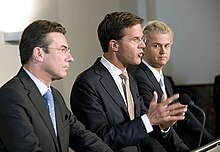 Wilders (right) with the leaders of VVD and CDA following the 2010 election. On 3 March 2010, elections for the local councils were held in the municipalities of The Netherlands. The PVV only contested these local elections in the Dutch towns The Hague and Almere, because of a shortage of good candidates. The big gains that were scored indicated that the party and Wilders might dominate the political scene in the run-up to the parliamentary elections scheduled on 9 June 2010. The PVV won in Almere and came second to the Dutch Labour party in The Hague. In Almere, the PVV won 21 percent of the vote to Labour's 18 percent, preliminary results showed. In The Hague, the PVV had 8 seats—second to Labour with 10 seats. On 8 March 2010, Wilders announced that he would take a seat on the Hague city council, after it became clear he won 13,000 preference votes. Earlier he had said he would not take up a seat if he won. In the parliamentary elections on 9 June 2010, the PVV increased its number of seats from 9 to 24 (out of 150), getting 15.5% of the vote. This made the PVV the third party in size. With a fragmented parliament, at least three parties were required for an absolute majority. A coalition of VVD and Christian Democratic Appeal (CDA) was negotiated with parliamentary support by the PVV. The PVV did not become part of the government formed by VVD and CDA but actively participated in the negotiations and thus policy decisions and – as part of the outcome agreed that they would not support any motion to dismiss ministers concerning topics listed in a so-called "support agreement" – much like the Danish model where the Danish People's Party plays a similar role. The very fact of the participation of Wilders' party in these negotiations caused fierce discussions in political circles. On 21 April 2012, Wilders withdrew his support from the Rutte cabinet because of new austerity measures that were about to be taken. Commenting on his withdrawal Wilders blamed the "European dictates" pointing to the 3% rule on budget deficit for European countries although his party had supported these rules earlier on. The cabinet blamed Wilders for what they call his "lack of political will" and "political cowardice" in regards to addressing the economic woes of the Netherlands. Wilders' withdrawal from the negotiations led to new elections in September. Wilders and the PVV ran on a campaign to have the Netherlands withdraw from the European Union and for a return to the guilder. The PVV won 10.1% of the vote and 15 seats in parliament, a loss of 9 seats. In the March 2014 local elections, Wilders' Party for Freedom only took part in two municipalities, The Hague and Almere, and suffered minor losses in both. Nevertheless, international news coverage of the elections was dominated by Wilders after he led his supporters in a provocative chant (calling for "fewer, fewer ... Moroccans") at an election night party rally. This eventually led to a new trial against him (see § Trials). In the May 2014 elections for the European Parliament, the Party for Freedom received 17.0% of the vote and four seats, a slight gain compared to the 13.3% of the vote the party had received in the previous parliamentary elections. In the run-up to and aftermath of those European elections, Wilders worked with the French Front National's Marine Le Pen to try to form a new parliamentary group in the European Parliament. They first announced their collaboration during a joint press conference in November 2013, where Wilders vowed that "today is the beginning of the liberation from the European elite, the monster in Brussels". Wilders visited the Sweden Democrats party and spoke with the Austrian Freedom party's leader Heinz-Christian Strache to help bring about the alliance, even while rejecting Hungary's Jobbik and Germany's NPD because he wanted to exclude "right-wing extremist and racist" parties. Three days after the elections finished, Le Pen and Wilders presented another press conference, this time with Matteo Salvini of Italy's Northern League, Harald Vilimsky of Austria's Freedom Party and Gerolf Annemans of Belgium's Flemish Interest party, to promise that the parliamentary group would be formed. Eventually, however, the effort failed because it could only unite parties from six EU member states, one fewer than is required by parliamentary rules. This was in part due to a refusal to include the Greek Golden Dawn or Poland's Congress of the New Right, and in part because parties like the Danish People's party and the True Finns refused to join. In the March 2015 provincial elections, the Party for Freedom received 11.7% of the vote nationally, slipping slightly from the 12.4% of the vote it had gotten in the 2011 provincial elections. The PVV contested the 2017 general election with Wilders at its helm. Although the PVV led other parties in opinion polls most of the time, all major parties ruled out forming coalitions with the PVV, effectively locking it out from any chance of taking part in, let alone leading, the next government. This raised the prospect of the PVV being locked out of power even if it won the most seats. Wilders hinted that a "revolution" would occur if his party won the most seats and was still shut out of government. The PVV ended up achieving second place after winning 20 seats, 5 more than in 2012. Wilders has become a controversial figure with polarized opinions on him from the world news media. Regarding his reputation in the Netherlands, Wilders stated in 2009, "Half of Holland loves me and half of Holland hates me. There is no in-between." In 2005, the Dutch public expressed mixed reactions to Wilders' general agenda, with 53% calling it "implausible" and 47% more supportive. He has been described as populist, labelled as both "extreme right" and far-right, and defended by others as a mainstream politician with legitimate concerns saying that such labels are shallow smear attempts. Wilders himself rejects the labels and has called such descriptions "scandalous". He has been accused of building his popularity on fear and resentment and vociferously defended for having the courage to talk openly about the problems unfettered immigration brings with it and the incompatibility of fundamentalist Islam with western values. On 15 December 2007, Wilders was declared "Politician of the Year" by NOS-radio, a mainstream Dutch radio station. The parliamentary press praised his ability to dominate political discussion and to attract the debate and to get into publicity with his well-timed one-liners. The editors eventually gave the title to Wilders because he was the only one who scored high among both the press and the general public. In December 2009, Wilders came in second in two polls in the Netherlands for Politician of the Year. A panel of Dutch television viewers praised him as "the second best" politician this year (after his outspoken critic Alexander Pechtold), while his colleagues in parliament named him "the second worst" (after Rita Verdonk). A lot of Muslim critics of Wilders accuse him of using Quranic verses out of context, and of manipulating verses to have a different meaning than the verses intended to. Because of Wilders' positions on Islam and calls for discrimination against Dutch citizens of minority ethnic descent, the Dutch–Moroccan rapper Appa, when interviewed about Wilders for a newspaper, said "if someone were to put a bullet in his head, I wouldn't mind". Wilders' views on Islam prompted the Mayor of Rotterdam, Ahmed Aboutaleb, to reprimand him. Editorials by AlterNet, The Montreal Gazette, The Wall Street Journal, The Guardian, and The New York Times have accused Wilders of hypocrisy given that, in their view, Wilders has called for the ban of the sale of the Quran while simultaneously arguing for his own personal freedom of speech. In a speech during a Dutch parliamentary debate, Wilders elaborated that he calls for the consistent application of Dutch laws restricting any act of expression that incites violence. Ideally, he would prefer to see nearly all such laws abolished. As such, he supports a European-wide constitutional protection of freedom of speech like that which exists in the United States. Wilders has also been compared to the assassinated fellow critic of Islam and filmmaker Theo van Gogh, but he does not see himself as taking on van Gogh's mantle. Wilders has stated that he supports the free speech rights of his critics, saying that "An Imam who wants a politician dead is—however reprehensible—allowed to say so". He has responded to critics' comments of racism and Islamophobia by stating, "I don't hate Muslims. I hate their book and their ideology". In February 2010, the trailer of a newly published online satirical video on the website of the Dutch radio station FunX, which targets a young urban audience, spoofed a murder attempt on Wilders. In July 2010, the magazine Inspire announced that Wilders, as well as Ayaan Hirsi Ali, Kurt Westergaard and Salman Rushdie, were mentioned on a "death list" of an international Islamist terrorist network. Shortly before this publication it was revealed in The Hague that Dutch law enforcement officers succeeded twice in smuggling a firearm into the parliament buildings and into the guarded headquarters of Wilders' party. This check was carried out by the Special Security Assignments Brigade BSB, a special unit of the Dutch Military Police. The test was carried out following a complaint from Wilders about his security being inadequate. On 11 September 2010, 2,000 people gathered close by the site of a planned Muslim community center near the site of the World Trade Center attacks, on 11 September 2001, where they were addressed by Wilders who flew from The Netherlands to urge the crowd: "This is where we have (to) draw the line. We must never give a free hand to those who want to subjugate us," Wilders added. "Draw this line so that New York... will never become New Mecca." Wilders was extensively discussed in American diplomatic cables, released by WikiLeaks in December 2010. In a briefing to president Barack Obama, he was described as "no friend of the US: he opposes Dutch military involvement in Afghanistan; he believes development assistance is money wasted; he opposes NATO missions outside 'allied' territory; he is against most EU initiatives; and, most troubling, he foments fear and hatred of immigrants." In July 2011, Anders Behring Breivik, the man who carried out the 2011 Norway attacks, expressed admiration for Geert Wilders and the Party for Freedom. Wilders immediately distanced himself strongly from Breivik. On 2 October 2011 Radio Netherlands Worldwide reported that a retired Dutch politician of the People's Party for Freedom and Democracy (VVD) Frits Bolkestein, who is sometime called the 'mentor' of Geert Wilders, "does not share his views". He reportedly said that "Wilders says things that are just not right and I think he totally exaggerates." While giving his opinion on burqa ban Mr Bolkestein said that he "disagrees with the recent introduction of a burqa ban, an idea championed by Geert Wilders." The Netherlands, he said, is the third European country to introduce such a ban after France and Belgium. "A ban makes martyrs of the few burqa wearers there are in the Netherlands", he said. In March 2014 and during a party meeting in The Hague on the evening of local elections, he sparked widespread controversy when he asked his attending supporters "Do you want, in this city, and in the Netherlands, more or fewer Moroccans? ", after which they chanted "Fewer! Fewer!". Wilders' response was "Then we'll fix it!". This action led several PVV representatives to resign, among whom two of the party's members of Parliament (Roland van Vliet and Joram van Klaveren), the party's leader in the European Parliament (Laurence Stassen), and a number of its provincial legislators and municipal councillors. Many politicians denounced what happened. In response, a number of young Moroccans launched a social media campaign called 'Born here', in which they posted pictures of themselves alongside their Dutch passports. Wilders generally considers himself to be a right-wing liberal, with a specific mix of positions independent of the European political spectrum and peculiar to iconoclastic Dutch society. He has stated, "My allies are not Le Pen or Haider ... We'll never join up with the fascists and Mussolinis of Italy. I'm very afraid of being linked with the wrong rightist fascist groups", adding that his drive instead is such issues as freedom of expression and Dutch iconoclasm. Wilders views British Prime Minister Margaret Thatcher as his greatest political role model. People's Party for Freedom and Democracy figure Frits Bolkestein also heavily influenced his beliefs. Wilders strongly opposes the Dutch political system in general. He believes that there is a ruling elite of parliamentarians who only care about their own personal careers and disregard the will of the people. He also blames the Dutch system of multiparty coalition governments for a lack of clear and effective policies. In his view, Dutch society advocates rule by consensus and cultural relativism, while he believes that this should change so as "not [to] tolerate the intolerant". On foreign relations, Wilders has largely supported Israel and has criticized countries he perceives as enemies of Israel. Further, he has made some proposals in the Dutch Parliament inspired by Israeli policies: for example, he supports implementing Israeli-style administrative detention in the Netherlands, a practice heavily criticized by human rights groups but which Wilders calls "common sense". Wilders often mentions Henk and Ingrid in his speeches, fictitious ordinary Dutch subjects for whom he claims to work. Henk and Ingrid represent "the Average Joe" in Dutch political parlance, the "heart and backbone of Dutch society". They have been compared to Joe the Plumber in Dutch media (though "Joe" is a real person). Henk and Ingrid live in a Vinex neighbourhood, have two school-attending children and a median income; both work outside the home. They used to vote for the PvdA but now vote for the PVV. Wilders has also revived the old idea of reuniting Flanders with the Netherlands. Instead of complicated reorganisation, a more accessible and humane health care system, especially for elderly citizens. Wilders is best known for his criticism of Islam, summing up his views by saying, "I don't hate Muslims, I hate Islam". His brother Paul claimed in an interview that, in his private affairs, Wilders has no problems with Muslims. Although identifying Islamic extremists as 5–15% of Muslims, he argues that "there is no such thing as 'moderate Islam'" and that the "Koran also states that Muslims who believe in only part of the Koran are in fact apostates". He suggests that Muslims should "tear out half of the Koran if they wished to stay in the Netherlands" because it contains "terrible things" and that Muhammad would "... in these days be hunted down as a terrorist". On 8 August 2007, Wilders opined in an open letter to the Dutch newspaper De Volkskrant that the Koran, which he called a "fascist book", should be outlawed in the Netherlands, like Adolf Hitler's Mein Kampf. He has stated that "The book incites hatred and killing and therefore has no place in our legal order". He has also referred to Mohammed as "the devil". In September 2009, Wilders proposed putting what he called a "head rag tax" on Hijab wearing by Muslim women; he suggested that women could purchase a license for €1000 and that the money raised could be used in projects beneficial to women's emancipation. Take a walk down the street and see where this is going. You no longer feel like you are living in your own country. There is a battle going on and we have to defend ourselves. Before you know it there will be more mosques than churches! Islam is the Trojan Horse in Europe. If we do not stop Islamification now, Eurabia and Netherabia will just be a matter of time. One century ago, there were approximately 50 Muslims in the Netherlands. Today, there are about 1 million Muslims in this country. Where will it end? We are heading for the end of European and Dutch civilisation as we know it. Where is our Prime Minister in all this? In reply to my questions in the House he said, without batting an eyelid, that there is no question of our country being Islamified. Now, this reply constituted a historical error as soon as it was uttered. Very many Dutch citizens, Madam Speaker, experience the presence of Islam around them. And I can report that they have had enough of burkas, headscarves, the ritual slaughter of animals, so‑called honour revenge, blaring minarets, female circumcision, hymen restoration operations, abuse of homosexuals, Turkish and Arabic on the buses and trains as well as on town hall leaflets, halal meat at grocery shops and department stores, Sharia exams, the Finance Minister's Sharia mortgages, and the enormous overrepresentation of Muslims in the area of crime, including Moroccan street terrorists. Nonetheless, Wilders has traveled widely in the Arab world and Der Spiegel has stated that Wilders will "wax poetic" over those "magnificent countries". Wilders has also said that "It's a real shame that these places are so chaotic." Wilders argues that Islam is not a religion, but rather a totalitarian political ideology such as communism and fascism. After the Dutch parliament turned down his request for an exhibition of cartoons depicting Prophet Muhammad be shown in parliament, Wilders vowed to show cartoons depicting him on television during time reserved for political parties. On 28 July 2015, Vienna's prosecutors' office launched a probe and lodged calls for criminal proceedings against Geert Wilders for allegedly comparing the Quran to Mein Kampf, after Tarafa Baghajati had accused him of hate speech and denigrating religious teachings. After the November 2015 Paris attacks, Wilders, in an article in The New York Times, argued for a national referendum in the Netherlands to decide about the refugee crisis. Wilders lived in Israel for two years during his youth and has visited the country 40 times in the last 25 years. Wilders stated about Israel: "I have visited many interesting countries in the Middle East – from Syria to Egypt, from Tunisia to Turkey, from Cyprus to Iran – but nowhere did I have the special feeling of solidarity that I always get when I land at Ben Gurion International Airport." Dutch public TV channel Nederland 2's daily news programme Netwerk reported that numerous American supporters of Israel financially supported Wilders' Party for Freedom (PVV) and openly approved of his message towards Islam and Islamic terrorism. Wilders told an audience during the report that "We [in the West] are all Israel". He has also said "Israel is the West's first line of defence" against what he perceives to be a threat posed by Islam. Following the Dutch general election, 2010, in which the PVV was the third biggest party, Wilders said Jordan should be renamed Palestine. The Jordanian government responded saying Wilders' speech was reminiscent of the Israeli right wing. His speech said "Jordan is Palestine. Changing its name to Palestine will end the conflict in the Middle East and provide the Palestinians with an alternate homeland." He also said Israel deserves a special status in the Dutch government because it was fighting for "Jerusalem" in its name. "If Jerusalem falls into the hands of the Muslims, Athens and Rome will be next. Thus, Jerusalem is the main front protecting the West. It is not a conflict over territory but rather an ideological battle, between the mentality of the liberated West and the ideology of Islamic barbarism. There has been an independent Palestinian state since 1946, and it is the kingdom of Jordan." He called on the Dutch government to refer to Jordan as Palestine and move its embassy to Jerusalem. Fitna is a 2008 short film written and commissioned by Wilders that explores Koranic-inspired motivations for terrorism, Islamic universalism, and Islam in the Netherlands. Its title comes from the Arabic word fitna, which means a "test of faith in times of trial", or refers to a situation where one's faith is tested. It is the subject of an international controversy and debate on free speech. Despite the legal troubles surrounding the film, Wilders insists that before he released it, he consulted numerous lawyers in the field, who found nothing worth prosecution. Jordan has summoned Wilders to court, with the film deemed to "incite hatred". Militant Sunni Islamist group Al-Qaeda issued a call to murder Wilders after its release. In the spring of 2009, Wilders launched the "Facing Jihad World Tour", a series of screenings of Fitna to public officials and influential organizations around the globe, starting in Rome. In the United States, Wilders showed the film to the United States Congress on 26 February, having been invited by Arizona Republican Senator Jon Kyl. Around 40 people attended the screening. American Muslims protested, but the groups said that they supported his right of free speech while still condemning his opinions. Wilders spoke at the Conservative Political Action Conference on 28 February. He appeared before the National Press Club and the Republican Jewish Coalition that week as well. Similar attempts in Britain led to a travel ban, and legislative blocks have prevented an appearance in Denmark. In September 2010, in an internet chat room, Australian Islamic fundamentalist preacher Feiz Mohammad urged his followers to behead Wilders. His rationale was his accusation that Wilders had "denigrat[ed]" Islam, and that anyone who "mocks, laughs or degrades Islam" as Wilders had must be killed "by chopping off his head." The Dutch newspaper De Telegraaf released an excerpt of the talk, after Dutch intelligence officials received a tip about the threat. I am threatened for the simple reason that I am an Islam critic. But, make no mistake, I am not the only one who is in danger. The Tsarnaev brothers drew inspiration from Feiz Mohammed's internet rants and decided to kill innocent onlookers at a marathon. Everyone is in danger. In 2010 Anwar al-Awlaki published a hit list in his Inspire magazine, including Wilders, Ayaan Hirsi Ali and Salman Rushdie along with cartoonists Lars Vilks and three Jyllands-Posten staff members: Kurt Westergaard, Carsten Juste, and Flemming Rose. The list was later expanded to include Stéphane "Charb" Charbonnier, who was murdered in a terror attack on Charlie Hebdo in Paris, along with 11 other people. After the attack, Al-Qaeda called for more killings. Lord Pearson of Rannoch and Baroness Cox, members of the House of Lords (the upper chamber of the British Parliament), invited Wilders to a show of 12 February 2009 viewing of Fitna in the Palace of Westminster. Two days before the showing, Home Secretary Jacqui Smith banned Wilders from entering the United Kingdom, labeling him an "undesirable person". Entry was denied under EU law, and reportedly supported under regulation 19 of the Immigration (European Economic Area) Regulations 2006, an EU law which allows a member state to refuse entry to individuals if they are regarded as constituting a threat to public policy, security or health. A Home Office spokesperson elaborated that "The Government opposes extremism in all its forms ... and that was the driving force behind tighter rules on exclusions for unacceptable behaviour that the Home Secretary announced in October last year"
Wilders defied the ban and took a British Midland Airways flight from Amsterdam to London Heathrow Airport on 12 February, accompanied by television crews. Upon arrival, he was quickly detained by UK Border Agency officials, and deported on one of the next flights to the Netherlands. He called Prime Minister Gordon Brown "the biggest coward in Europe" and remarked, "Of course I will come back". Wilders had visited the United Kingdom in December 2008 without any problem. In response to the ban, both Pearson and Cox accused the government of "appeasing" militant Islam. The International Herald Tribune stated that the ban was broadly condemned in the British news media. The Dutch Foreign Secretary, Maxime Verhagen, called the decision "highly regrettable" and complained to his British counterpart. Dutch Prime Minister Jan Peter Balkenende complained to Gordon Brown about the "disappointing" decision. The Quilliam Foundation, a British think tank, criticised the ban, as did National Secular Society president Terry Sanderson. The Muslim Labour peer Lord Ahmed expressed support for Smith's ban on Wilders entering the country; the Ramadhan Foundation and the Muslim Council of Britain also did so, the council labeling Wilders "an open and relentless preacher of hate". After being declared persona non grata by Jacqui Smith, then the Home Secretary, in February 2009, Wilders appealed the decision to Britain's Asylum and Immigration Tribunal. In October 2009, the tribunal overturned the ban. Wilders subsequently praised the ruling as "a triumph for freedom of speech" and stated that he planned to visit the United Kingdom in the near future. "The Government opposes extremism in all its forms. The decision to refuse Wilders admission was taken on the basis that his presence could have inflamed tensions between our communities and have led to inter-faith violence. We still maintain this view." "a celebration of the victory of freedom of speech over those who would prevent it in this country, particularly the Islamists, the violent Jihadists who are on the march across the world and in the UK." "Mohammedanism is a militant and proselytizing faith. No stronger retrograde force exists in the World. It has already spread throughout Central Africa, raising fearless warriors at every step ... the civilization of modern Europe might fall, as fell the civilization of ancient Rome." "He incites discord among people in a distasteful manner. And in the meantime he damages the interests of the Dutch population and the reputation of the Netherlands in the world." Bernard Wientjes, the president of the Dutch employers' organization Confederation of Netherlands Industry and Employers (VNO-NCW), also accused Wilders of "seriously" damaging Dutch interests abroad. He called it outrageous that Wilders had presented himself in London as "the next Dutch prime minister" and then derided Turkish Prime Minister Erdoğan. Emphasizing that three-quarters of the Dutch GDP comes from revenue earned abroad, according to Wientjes, Wilders poses "a serious threat to the Netherlands and the Dutch economy". "I have decided not to intervene to deny him a visa because I believe that our democracy is strong enough, our multiculturalism robust enough and our commitment to freedom of speech entrenched enough that our society can withstand the visit of a fringe commentator from the other side of the world". On the same day, the Q Society put out a press release criticizing the delays in issuing a visa, saying that Chris Bowen's announcement was "too little, too late" and announcing that Wilders' visit would be pushed back to February 2013 as there were still no visa documents available. In March 2010, Wilders was told he is "not welcome" in the western German tourist resort of Monschau in the Eifel area, after he spent a weekend there, along with several armed bodyguards. Mayor Margareta Ritter (CDU) said she was concerned that his presence tainted her town with the suspicion that it was sympathetic to his views. As a result, Monschau was said to have been unfairly connected with "extremism" in the European press. "Anyone who pollutes the integration debate in the Netherlands with poisonous right-wing populism as Wilders has, and advocates prohibition of the Koran by a comparison with Hitler's Mein Kampf, is not welcome in Monschau. I wanted to distinguish Monschau from that." Ritter didn't say whether Wilders was enjoying a short vacation in her town or had been meeting with like-minded people. A demonstration to support Wilders was announced to take place in Berlin on 17 April. In October 2010, Wilders supported the founding of the German Freedom Party. In April 2015, Wilders held a speech for Pegida in Dresden. In July 2010, Wilders announced the International Freedom Alliance, a network of groups and individuals who "are fighting for freedom against Islam". Wilders plans IFA branches in the United States, Canada, Britain, France and Germany by late 2010. "The message, 'stop Islam, defend freedom', is a message that's not only important for the Netherlands but for the whole free Western world", Wilders stated in an address to reporters at the Dutch Parliament. On 6 August 2010, Wilders, who had become a regular guest with American conservatives and libertarians, announced that he would speak at a rally on 11 September in New York to protest the plans for Park51, a Muslim community center with a prayer space to be built near the World Trade Center site. The rally, to be held on the ten-year anniversary of the 11 September 2001 attacks, was organised by Stop Islamization of America, which was supported by former House speaker Newt Gingrich, who was originally announced as a speaker at the event, but never confirmed his appearance and cancelled a video appearance. According to SIOA's website world leaders, prominent politicians and 9/11 family members would be speaking at the rally, but Wilders was not mentioned by name, though he did attend as he had announced. In political circles in The Netherlands, the announcement caused widespread irritation about his plan. Christian Democrat senator Hans Hillen remarked that Wilders' words could endanger Dutch interests. Former NATO general secretary Jaap de Hoop Scheffer advised Wilders not to make a speech, arguing that the international public does not know who is in the Dutch cabinet and who is in parliament and thus Wilders' speech could be mistaken as an official statement of the Dutch government. Also Christian Democrat party leader and acting Dutch Minister of Foreign Affairs Maxime Verhagen issued a warning. Also, the Dutch Foreign Ministry allegedly would have issued guidelines to its embassies on how to react to questions about the role being played by the PVV and Wilders in the formation of a new government. On 10 August 2010, the website of Dutch daily newspaper NRC Handelsblad published the ministry memo. The ministry itself however had declined "to confirm or deny" the authenticity of these guidelines. One question posed is how Wilders could be taking part in negotiations on forming a government coalition when he has been indicted for inciting hatred and discrimination, and for insulting a group of persons. Other questions covered possible bans on the building of new mosques, on the Quran and on Islamic schools in the Netherlands. The memo stressed that such bans would breach the Dutch constitution. Wilders spoke on Thursday, 12 May 2011, at Cornerstone Church in Madison, Tennessee, at the Tennessee Freedom Coalition inaugural Signature Series event. In May 2015, Geert Wilders was invited to an art exhibit presented by Stop Islamization of America in Garland, Texas, that offered a $10,000 prize for the best drawing of Muhammad. Towards the end of the event, two gunmen opened fire outside, injuring a police officer before being shot dead by other police officers guarding the center. Several groups and persons in the Netherlands have called for legal action against Wilders, while others defended his right to free speech. On 15 August 2007, a representative of the Prosecutors' Office in Amsterdam declared that dozens of reports against Wilders had been filed, and that they were all being considered. Attempts to prosecute Wilders under Dutch anti-hate speech laws in June 2008 failed, with the public prosecutor's office stating that Wilders' comments contributed to the debate on Islam in Dutch society and also had been made outside parliament. The office released a statement reading: "That comments are hurtful and offensive for a large number of Muslims does not mean that they are punishable. Freedom of expression fulfils an essential role in public debate in a democratic society. That means that offensive comments can be made in a political debate." On 21 January 2009, a three-judge court ordered prosecutors to try him. The Middle East Forum established a Legal Defence Fund for Wilders's defence. The New York Times ran an op-ed criticizing his views and arguing that "for a man who calls for a ban on the Koran to act as the champion of free speech is a bit rich", concluding, however that the lawsuit against Wilders might not be "a good thing for democracy", because it made him "look more important than he should be." A survey by Angus Reid Global Monitor found that public opinion is deeply split on the prosecution, with 50% supporting Wilders and 43% opposed. However, as of 2009, public support for the Party for Freedom had greatly increased since Wilders' legal troubles began, with the Party for Freedom virtually tied with the People's Party for Freedom and Democracy to be the third most popular party. According to Radio Netherlands, "Dutch politicians themselves seem to be keeping quiet on the issue; they are probably worried that media attention will only serve to make the controversial politician more popular". In late October 2010, the Dutch court approved a request from Geert Wilders to have new judges appointed forcing the court to retry the case. On 7 February 2011, Wilders returned to the court room in order that his legal team could present evidence from Islamic experts which the court rejected in 2010, including Mohammed Bouyeri, who murdered film-maker Theo van Gogh, and Dutch academic Hans Jansen. On 23 June 2011, Wilders was acquitted of all charges. A Dutch court said that his speech was legitimate political debate, but on the edge. Because both the public prosecutor and the defence requested complete acquittal, the verdict will most likely not be appealed. On 18 March 2016, a second trial against Wilders began, this time on the accusation of inciting "discrimination and hatred" against Moroccans living in the Netherlands. On 17 November 2016, the Dutch Public Prosecution Service demanded a fine against him of €5,000 (£4,300). On 9 December 2016, he was convicted in a hate speech trial but no penalty was imposed. ^ Castle, Stephen (5 August 2010). "Dutch Opponent of Muslims Gains Ground". The New York Times. Netherlands. Retrieved 31 May 2011. ^ Mock, Vanessa (11 June 2010). "Wilders makes shock gains in Dutch elections". The Independent. London. Retrieved 18 June 2010. ^ a b Associated Press (20 April 2012). "Dutch prime minister says government austerity talks collapse". The Washington Post. Archived from the original on 22 April 2012. Retrieved 28 April 2012. ^ a b c d e f Traynor, Ian (17 February 2008). "'I don't hate Muslims. I hate Islam,' says Holland's rising political star". The Guardian. London. Archived from the original on 1 September 2013. Retrieved 15 March 2009. ^ a b Surge for Dutch anti-Islam Freedom Party, BBC News, 10 June 2010. ^ "Nancy Graham Holm: Three Questions to Ask Geert Wilders about Anti-Islam Hate Speech". Huffington Post. USA. 22 April 2011. Retrieved 31 May 2011. ^ Hardy, Roger (28 April 2010). "Dutch Muslim women striving to integrate". BBC News. British Broadcasting Corporation. Retrieved 18 July 2014. Mr Wilders wants the authorities to halt all immigration from Muslim countries. ^ Robert Marquand. "Dutch voters boost far-right party of Geert Wilders", The Christian Science Monitor, 10 June 2010. ^ "PVV: Leger inzetten tegen straatterreur Gouda" (in Dutch). Elsevier.nl. 15 September 2008. Archived from the original on 10 November 2008. Retrieved 18 June 2010. ^ "JP-tegner klar til sag mod Wilders" (in Danish). Retrieved 22 May 2017. ^ a b c d e West, Ed (30 January 2010). "Geert Wilders is not 'far Right'". The Daily Telegraph. London. Archived from the original on 9 April 2016. Retrieved 18 June 2010. ^ a b c "Dutch populist Wilders 'unwelcome' in Eifel town". Thelocal.de. Archived from the original on 31 May 2010. Retrieved 18 June 2010. ^ a b c "Rechtspopulist Wilders in Monschau nicht willkommen". General-anzeiger-bonn.de. 16 March 2010. Archived from the original on 22 July 2011. Retrieved 18 June 2010. ^ Rothwell, James (15 March 2017). "Dutch election: Polls open as far-right candidate Geert Wilders takes on Mark Rutte". The Telegraph. Retrieved 15 March 2017. ^ "Geert Wilders, Dutch Far-Right Leader, Is Convicted of Inciting Discrimination". The New York Times. 9 December 2016. ^ a b c d Gosden, Emily (11 February 2009). "Far-right Dutch MP Geert Wilders vows to defy UK ban". The Times. London. Retrieved 15 March 2009. ^ "In quotes: Geert Wilders". BBC. 4 October 2010. Retrieved 31 July 2011. ^ a b "PVV: Wilders and Le Pen join forces on anti-EU group". EU Observer. 14 November 2013. Retrieved 11 April 2015. ^ a b "Le Pen and Wilders forge plan to 'wreck' EU from within". The Guardian. 13 November 2013. Retrieved 11 April 2015. ^ a b c "Buoyant Le Pen seeks more allies for Eurosceptic group in Brussels". The Guardian. 28 May 2014. Retrieved 11 April 2015. ^ a b "Le Pen and Wilders fail to form anti-EU bloc". BBC. 24 June 2014. Retrieved 11 April 2015. ^ "Geert Wilders guilty of incitement". POLITICO. 9 December 2016. Retrieved 22 May 2017. ^ a b Tyler, John (24 January 2008). "Geert Wilders: Pushing the envelope". Radio Netherlands Worldwide. Archived from the original on 14 June 2007. Retrieved 15 March 2008. ^ Lizzy van Leeuwen (2 September 2009). "Wreker van zijn Indische grootouders" (in Dutch). De Groene Amsterdammer. Retrieved 26 December 2013. ^ Bert Bukman (6 January 2012). "'Waarom is het haar van Geert Wilders blond?'". De Volkskrant (in Dutch). Retrieved 26 December 2013. ^ "Geert Wilders' Indonesian roots define his politics, says anthropologist". Vorige.nrc.nl. 4 September 2009. Archived from the original on 20 July 2011. Retrieved 31 May 2011. ^ a b c d "Iran Warns Netherlands Not to Air Controversial 'Anti-Muslim' Film". Fox News Channel. 21 January 2008. Archived from the original on 12 June 2009. Retrieved 15 March 2009. ^ "G. Wilders – Parlement & Politiek" (in Dutch). Parlement.com. Retrieved 24 March 2008. ^ a b c d e f g h i Traufetter, Gerald (27 March 2008). "A Missionary with Dark Visions". Der Spiegel. Retrieved 15 March 2009. ^ a b Liphshiz, Cnaan (29 April 2014). "Geert Wilders and Dutch Jews – end of the affair?". Haaretz. Retrieved 12 March 2017. ^ a b c "Verliefd op Israël". De Volkskrant (in Dutch). 10 April 2007. Archived from the original on 3 July 2015. Retrieved 21 June 2009. ^ a b c d e Kirby, Paul (27 March 2008). "Profile: Geert Wilders". BBC News. Retrieved 13 March 2009. ^ a b c d e f g Stokmans, Derk (28 March 2008). "Who is Geert Wilders?". NRC Handelsblad. Archived from the original on 5 March 2009. Retrieved 13 March 2009. ^ "The rise and fall of Geert Wilders?". Al Jazeera. Retrieved 13 September 2012. ^ Smith, Craig S (11 November 2004). "Dutch Police Seize 2 in Raid on Terror Cell After a Siege". The New York Times. Retrieved 24 March 2008. ^ "Dutch 'must show' anti-Islam film". BBC. 10 March 2008. Retrieved 24 March 2008. ^ "Death Threats Greet Dutch Lawmaker's Call to Ban the Koran". Cnsnews.com. 10 August 2007. Archived from the original on 11 February 2010. Retrieved 18 June 2010. ^ "Kort nieuws binnenland" (in Dutch). NOS Nieuws. 28 September 2007. Archived from the original on 26 December 2007. Retrieved 24 March 2008. ^ "Rapper bestraft voor bedreigen Wilders" (in Dutch). Nrc.nl. Retrieved 18 June 2010. ^ "Wilders most threatened politician". Dutch News. 13 March 2009. Retrieved 15 March 2009. ^ Simons, Marlise (4 March 2005). "Tired of hiding, 2 Dutch legislators emerge". International Herald Tribune. Archived from the original on 3 December 2008. Retrieved 15 March 2009. ^ "In Netherlands, Anti-Islamic Polemic Comes With a Price". washingtonpost.com. ^ "Europe's veil of fear". ynet. ^ "Echtgenote vroeg Geert Wilders nooit te stoppen – RTL Boulevard" (in Dutch). Rtl.nl. Archived from the original on 5 June 2010. Retrieved 17 February 2011. ^ "Undercover journalist gains easy access to Geert Wilders". Nrc.nl. Retrieved 18 June 2010. ^ "Wilders' security breached". RNW. ^ "Wilders' security stepped up after officials smuggle in gun – DutchNews.nl". DutchNews.nl. ^ Rengers, Merijn; Schoorl, John (19 May 2011). "Wilders verzuimde om eigen BV te melden". de Volkskrant (in Dutch). Retrieved 28 April 2012. ^ "This is Geert Wilders, the Dutch populist who could win but not rule: 4. So what's with the blonde hair?". NRC. 8 March 2017. Retrieved 11 October 2017. ^ "Geert Wilders: riding the hype". Radio Netherlands Worldwide. Archived from the original on 29 January 2008. Retrieved 15 March 2009. ^ Geert Wilders (19 July 2010). "Moslims, bevrijd uzelf en u kunt alles" [Muslims, you can free yourself and everything]. NRC Handelsblad (in Dutch). Archived from the original on 22 July 2010. Retrieved 3 October 2010. Zelf ben ik agnost. ^ Hurd, Dale (19 February 2009). "VIDEO: Can Christians Support Geert Wilders". Christian Broadcasting Network. Archived from the original on 12 March 2011. Retrieved 15 May 2011. ^ "Geert Wilders Fitna Movie Timeline". FeceOnAir.com. Archived from the original on 6 March 2008. Retrieved 8 March 2008. ^ Richburg, Keith B. (1 February 2005). "Washingtonpost.com". The Washington Post. Archived from the original on 24 July 2008. Retrieved 18 June 2010. ^ "Election Pamphlet". Party for Freedom. Retrieved 12 February 2009. ^ Burns, John (12 February 2009). "Britain Refuses Entry to Dutch Lawmaker Whose Remarks and Film Have Angered Muslims". The New York Times. Archived from the original on 15 May 2013. Retrieved 13 March 2009. ^ "Wilders: I want to be prime minister". Dutchnews.nl. 17 March 2009. Archived from the original on 21 March 2009. Retrieved 18 June 2010. ^ a b "Geert Wilders' Freedom Party rises to 32 seats". Radio Netherlands Worldwide. 29 March 2009. Archived from the original on 25 September 2012. Retrieved 22 January 2011. ^ a b Waterfield, Bruno (3 March 2009). "Geert Wilders leads Dutch polls". The Daily Telegraph. UK. Archived from the original on 7 March 2009. Retrieved 15 March 2009. ^ "Wilders' Freedom Party leads polls". Radio Netherlands Worldwide. 1 March 2009. Archived from the original on 25 June 2009. Retrieved 22 January 2011. ^ "Wilders Now a Celebrity in US and Prime Minister in Poll". NIS News Bulletin. 3 March 2009. Archived from the original on 22 July 2009. Retrieved 15 March 2009. ^ "Wilders to take council seat in the Hague". Dutchnews.nl. 8 March 2010. Archived from the original on 12 March 2010. Retrieved 18 June 2010. ^ "Anti-Islam MP Geert Wilders has announced he will take up a seat on the local council of the city of The Hague". Rnw.nl. 8 March 2010. Archived from the original on 12 May 2010. Retrieved 18 June 2010. ^ Berkowitz, Ben; Kreijger, Gilbert (30 July 2010). "Dutch close in on government with anti-Islam party backing". Reuters. Archived from the original on 21 June 2013. Retrieved 19 February 2011. ^ "Dutch Prime Minister Mark Rutte claims victory for his VVD party in election". The Washington Post. Archived from the original on 18 September 2012. Retrieved 13 September 2012. ^ "Verkiezingsuitslagen Tweede Kamer 1918-heden" (in Dutch). Kiesraad (Electoral Council). Archived from the original on 29 March 2015. Retrieved 11 April 2015. ^ "Dutch politician Geert Wilders takes aim at Moroccans and sparks outrage". the Guardian. Archived from the original on 19 October 2018. Retrieved 6 January 2019. ^ "Dutch politician Wilders accused of discrimination". BBC News. Archived from the original on 6 September 2017. Retrieved 6 January 2019. ^ "Dutch far-right in crisis over Wilders chant". aljazeera.com. Archived from the original on 1 August 2018. Retrieved 6 January 2019. ^ "Dutch populist Wilders faces huge backlash on Moroccan critique". The Times of Israel. Archived from the original on 14 July 2017. Retrieved 6 January 2019. ^ "Dutch populist politician Geert Wilders leads his followers in anti-Moroccan chant". Fox News. Archived from the original on 24 September 2015. Retrieved 6 January 2019. ^ "Euroskeptic Union: Right-Wing Populists Forge EU Alliance". Spiegel Online. 13 November 2013. Archived from the original on 15 April 2015. Retrieved 11 April 2015. ^ "Le Pen vows far-right EU Parliament group by end of the year". EurActiv. 25 June 2014. Archived from the original on 16 April 2015. Retrieved 11 April 2015. ^ "VVD leader Mark Rutte says zero' chance of coalition with Geert Wilders". DutchNews. 16 January 2017. Archived from the original on 18 May 2017. Retrieved 6 January 2019. ^ Ashley Kirk; Patrick Scott (17 March 2017). "Dutch election: How the far Right could win but not rule in a country known for its liberal values". The Daily Telegraph. Archived from the original on 5 September 2018. Retrieved 6 January 2019. ^ "VVD wins 33 seats but coalition partner Labour is hammered". Dutch News. 16 March 2017. Archived from the original on 27 March 2018. Retrieved 6 January 2019. ^ a b Chadwick, Nicola (22 January 2009). "Worldwide reactions to Wilders' prosecution". Radio Netherlands Worldwide. Archived from the original on 18 February 2009. Retrieved 15 March 2009. ^ Meo, Nick (14 June 2009). "Dutch divided over Geert Wilders as radical MP eyes premiership". Sunday Telegraph. London. Archived from the original on 17 June 2009. Retrieved 19 June 2009. ^ a b c "Dutch Divided on Wilders Agenda". NIS News Bulletin. 15 March 2005. Archived from the original on 25 August 2010. Retrieved 15 March 2008. ^ "Dutch extreme-right MP calls for Koran ban". European Jewish Press. Agence France-Presse. 8 August 2007. Archived from the original on 29 July 2010. Retrieved 15 March 2009. ^ a b "Prosecution of Dutch populist will provide a judicial soap opera". The Irish Times. 11 February 2009. Archived from the original on 19 October 2012. Retrieved 15 March 2009. ^ Weaver, Matthew (21 January 2009). "Dutch court says anti-Islam MP must face race hatred prosecution". The Guardian. London. Archived from the original on 5 September 2013. Retrieved 15 March 2009. ^ "The Big Muslim Problem!". New York Review of Books. 17 December 2009. Archived from the original on 6 June 2011. Retrieved 31 May 2011. ^ "Wilders politicus van 2007". NOS Journaal (in Dutch). 14 December 2007. Archived from the original on 18 December 2007. Retrieved 24 March 2008. ^ "Wilders uitgeroepen tot winnaar in NOS-peiling". nu.nl (in Dutch). 15 December 2007. Archived from the original on 9 January 2009. Retrieved 24 March 2008. ^ Steen, Michael (27 December 2007). "Anti-Islamic outsider is top Dutch politician". Financial Times. Retrieved 24 March 2008. ^ "Geert Wilders, loved and loathed". Expatica.com. Archived from the original on 25 September 2012. Retrieved 17 February 2011. ^ "Saudi blogger posts video on Christian extremism". The Sydney Morning Herald. Associated Press. 11 April 2008. Archived from the original on 12 April 2008. Retrieved 14 March 2008. ^ Goodenough, Patrick (16 November 2007). "Dutch Reject Call to Ban Koran But Worry About Islam". Cybercast News Service. Archived from the original on 8 December 2007. Retrieved 24 March 2008. ^ Z., Jonas (2 April 2008). "Aboutaleb reprimands Wilders" (in Dutch). FOK news. Archived from the original on 12 March 2008. Retrieved 15 March 2008. ^ a b Lubań, Daniel; Clifton, Eli (3 March 2009). "U.S. Politicians Warmly Greet Reactionary Dutch Islamophobe". Inter Press Service. AlterNet. Archived from the original on 12 March 2009. Retrieved 15 March 2009. ^ Stephens, Bret (17 February 2009). "Geert Wilders Is a Test for Western Civilization". The Wall Street Journal. Archived from the original on 7 May 2015. Retrieved 15 March 2009. ^ a b Buruma, Ian (29 January 2009). "Totally Tolerant, Up to a Point". The New York Times. Archived from the original on 20 May 2011. Retrieved 15 March 2009. ^ a b c Ahmed, Nazir (13 February 2009). "Wilders' ban is in Britain's best interests". The Guardian. UK. Archived from the original on 6 September 2013. Retrieved 15 March 2009. ^ a b c "Mr Wilderss contribution to the parliamentary debate on Islamic activism". Groep Wilders. 6 September 2007. Archived from the original on 14 June 2008. Retrieved 15 March 2009. ^ Kongstad, Jesper (4 February 2009). "Wilders: "Jeg er dybt skuffet over Fogh" (Mr. Wilders writing in the Danish Newspaper Jyllands-Posten)". Jyllands-Posten (in Danish). Archived from the original on 13 February 2009. Retrieved 15 March 2009. ^ a b Bostom, Andrew G. (22 February 2009). "Geert Wilders and the 'Koran Ban'". American Thinker. Archived from the original on 29 March 2009. Retrieved 15 March 2009. ^ "Party furious over spoof Wilders murder film". Rnw.nl. Archived from the original on 8 February 2010. Retrieved 18 June 2010. ^ "Geert Wilders en Ayaan Hirsi Ali op dodenlijst" (in Dutch). Nrc.nl. 2 September 2008. Archived from the original on 19 July 2010. Retrieved 16 January 2011. ^ "Wilders' security breached". Expatica.com. Archived from the original on 8 July 2010. Retrieved 16 January 2011. ^ "Dutch anti-Islam MP addresses NY mosque rally". Middle East Online. Archived from the original on 14 July 2011. Retrieved 31 May 2011. ^ "US embassy cables: Barack Obama's briefing on Dutch politics". The Guardian. UK. 15 December 2010. Archived from the original on 21 December 2013. Retrieved 16 January 2011. ^ "Wilders' 'mentor' thinks he is exaggerating". Radio Netherlands Worldwide. 2 October 2011. Archived from the original on 29 December 2011. Retrieved 28 April 2012. ^ "Wie zijn er vertrokken bij de PVV?" (in Dutch). NOS. 6 May 2014. Archived from the original on 27 March 2014. Retrieved 11 April 2014. ^ a b c Sackur, Steven (22 March 2006). "Geert Wilders". HARDtalk. Archived from the original on 7 March 2008. Retrieved 30 March 2008. ^ a b "PVV doet het voor Henk en Ingrid". De Telegraaf (in Dutch). 23 April 2010. Archived from the original on 6 August 2011. Retrieved 20 September 2011. ^ a b "Willen de echte Henk en Ingrid opstaan?". NRC Next (in Dutch). 27 April 2011. Archived from the original on 4 May 2010. Retrieved 19 September 2011. ^ "Wie zijn Henk en Ingrid?". RTL Nieuws (in Dutch). 23 April 2010. Archived from the original on 5 May 2011. Retrieved 19 September 2011. ^ "Klare Wijn" (in Dutch). Party for Freedom. 31 March 2006. Archived from the original on 6 December 2008. Retrieved 15 March 2009. ^ Stefanie March (16 March 2017). "'This Is Exactly What He Wants': How Geert Wilders Won by Losing". The Atlantic. Archived from the original on 12 September 2018. Retrieved 6 January 2019. ^ Waterfield, Bruno (14 August 2007). "Ban Koran like Mein Kampf, says Dutch MP". The Daily Telegraph. UK. Archived from the original on 24 March 2010. Retrieved 24 March 2008. ^ Wilders, Geert (8 August 2007). "Genoeg is genoeg: verbied de Koran". De Volkskrant (in Dutch). Archived from the original on 1 April 2008. Retrieved 24 March 2008. ^ "Wilders: verbied de Koran, ook in moskee". De Volkskrant (in Dutch). 8 August 2007. Archived from the original on 12 September 2007. Retrieved 8 August 2007. ^ den Boer, Nicolien (8 January 2007). "'Qur'an should be banned' – Wilders strikes again". Radio Netherlands. Archived from the original on 15 March 2008. Retrieved 24 March 2008. ^ "Speech by Geert Wilders on the first day of the General Debate in the Dutch parliament". geertwilders.nl. 18 September 2009. Archived from the original on 17 July 2011. ^ John Tyler (16 September 2009). "Wilders wants headscarf tax". RNW. Archived from the original on 7 June 2011. Retrieved 27 January 2011. ^ "Wilders: get rid of half of Koran!". Expatica. Internet Archive. 13 February 2007. Archived from the original on 14 May 2007. Retrieved 24 March 2008. ^ "Geert Wilders: Man Out of Time". Aina.org. 26 January 2009. Archived from the original on 7 September 2012. Retrieved 31 May 2011. ^ "Dutch MP Geert Wilders to show Muhammad cartoons on TV". 4 June 2015. Archived from the original on 6 September 2017. Retrieved 6 January 2019 – via www.bbc.com. ^ "Austria investigates Dutch politician's remarks". Archived from the original on 3 December 2018. Retrieved 6 January 2019. ^ "Geert Wilders: Let the Dutch Vote on Immigration Policy". The New York Times. 20 November 2015. Archived from the original on 4 January 2019. Retrieved 6 January 2019. ^ "De sterke wil van Wilders" (in Dutch). geertwilders.nl, now on WayBack machine: Web.archive.org. 14 October 2006. Archived from the original on 14 October 2006. Retrieved 31 May 2011. ^ a b "Amerikaanse Wilders-fans: 'foremost hero of our age'". Netwerk.tv. 10 June 2009. Archived from the original on 11 October 2009. Retrieved 31 May 2011. ^ Liphshiz, Cnaan. "Dutch anti-Islam MP: 'Israel is West's first line of defense'". Haaretz. Archived from the original on 21 September 2009. Retrieved 11 October 2009. ^ "Geert Wilders: Change Jordan's name to Palestine Archived 2018-12-07 at the Wayback Machine." Roee Nahmias, Israel News, 20 June 2010. ^ a b c "Holland declines to prosecute anti-Islam politician". International Herald Tribune. Reuters. 30 June 2008. Archived from the original on 30 January 2009. Retrieved 14 March 2009. ^ "Wilders faces arrest by Jordan over Fitna". Dutch News. 20 June 2008. Archived from the original on 14 February 2009. Retrieved 15 March 2009. ^ Liphshiz, Cnaan (13 February 2009). "Dutch lawmaker banned from U.K. to take anti-Koran film on 'world tour'". Haaretz. Archived from the original on 21 March 2009. Retrieved 13 March 2009. ^ a b O'Connor, Anahad (26 February 2009). "Mr. Wilders Goes to Washington". The New York Times. Archived from the original on 18 March 2009. Retrieved 15 March 2009. ^ Poole, Patrick (1 March 2009). "Was CPAC an Epic Fail?". Pajamas Media. p. 2. Archived from the original on 4 March 2009. Retrieved 15 March 2009. ^ "Political row in Denmark over Geert Wilders". Radio Netherlands Worldwide. 25 March 2009. Archived from the original on 1 June 2009. Retrieved 30 March 2009. ^ "Aussie cleric Feiz Mohammad calls for beheading of Dutch MP Geert Wilders". The Australian. 3 September 2010. Retrieved 22 April 2013. ^ Berkowitz, Ben (3 September 2010). "Muslim cleric calls for beheading of Dutch politician". Reuters. Archived from the original on 17 June 2017. Retrieved 25 October 2011. ^ Natalie O'Brien (6 September 2010). "Preacher's call for beheading condemned by Muslim leaders". Sydney Morning Herald. Archived from the original on 16 May 2014. Retrieved 22 April 2013. ^ "No surprise the Boston bombers were fans of the sheik". The Australian. 26 April 2013. Archived from the original on 30 April 2013. Retrieved 27 April 2013. ^ Dashiell Bennet (1 March 2013). "Look Who's on Al Qaeda's Most-Wanted List". The Wire. Archived from the original on 8 January 2015. Retrieved 6 January 2019. ^ Conal Urquhart. "Paris Police Say 12 Dead After Shooting at Charlie Hebdo". Time. Archived from the original on 7 January 2015. Retrieved 6 January 2019. ^ Victoria Ward. "Murdered Charlie Hebdo cartoonist was on al Qaeda wanted list". The Telegraph. Archived from the original on 7 January 2015. Retrieved 6 January 2019. ^ Lucy Cormack (8 January 2015). "Charlie Hebdo editor Stephane Charbonnier crossed off chilling al-Qaeda hitlist". The Age. Archived from the original on 11 January 2015. Retrieved 6 January 2019. ^ a b Hope, Christopher; Bingham, John; Waterfield, Bruno (13 February 2009). "Dutch MP Geert Wilders deported after flying to Britain to show anti-Islamic film". The Daily Telegraph. UK. Archived from the original on 3 March 2009. Retrieved 15 March 2009. ^ "Home Office letter to Geert Wilders" (PDF). 10 February 2009. Retrieved 18 June 2010. ^ "The Immigration (European Economic Area) Regulations 2006". Archived from the original on 15 May 2013. Retrieved 20 March 2013. ^ Russell, Ben; Mock, Vanessa (11 February 2009). "Banned from Britain, Dutch campaigner against Islam". The Independent. UK. Archived from the original on 1 April 2009. Retrieved 18 June 2010. ^ "How the flying Dutchman was stopped in his tracks". The Independent. UK. 13 February 2009. Archived from the original on 2 April 2009. Retrieved 18 June 2010. ^ Christopher Hope, John Bingham and Bruno Waterfield (12 February 2009). "Dutch MP Geert Wilders deported after flying to Britain to show anti-Islamic film". Telegraph.co.uk. Archived from the original on 10 October 2018. Retrieved 6 January 2019. ^ a b Burns, John F. (12 February 2009). "Britain deports Dutch 'provocateur'". International Herald Tribune. Archived from the original on 12 March 2017. Retrieved 15 March 2009. ^ a b c Siddique, Haroon (12 February 2009). "Far-right Dutch MP refused entry to UK". The Guardian. London. Archived from the original on 6 September 2013. Retrieved 15 March 2009. ^ Gosden, Emily (20 March 2009). "Dutch MP appeals against UK ban". The Times. London. Archived from the original on 23 March 2009. Retrieved 20 March 2013. ^ "PM lodges protest over UK's MP ban" (PDF). Radio Netherlands Worldwide. 13 February 2009. Archived from the original (PDF) on 2 August 2013. Retrieved 15 March 2009. ^ Khan, Riz (19 February 2009). "Riz Khan – Banning Geert Wilders". Al Jazeera. Archived from the original on 21 January 2010. Retrieved 15 March 2009. ^ "Banned Dutch MP launches appeal". ITN. 20 March 2009. Archived from the original on 2 April 2009. Retrieved 20 March 2009. ^ a b c Hughes, Mark (13 October 2009). "Dutch 'extremist' Geert Wilders wins appeal to enter Britain". The Independent. UK. Archived from the original on 19 June 2017. Retrieved 18 June 2010. ^ a b Savage, Michael (17 October 2009). "Wilders hails his arrival in UK as victory for free speech". The Independent. UK. Archived from the original on 19 October 2009. Retrieved 18 June 2010. ^ a b Travis, Alan (13 October 2009). "Geert Wilders wins appeal against ban on travelling to UK". The Guardian. UK. Archived from the original on 8 September 2013. Retrieved 7 January 2013. ^ "Far-right Dutch MP arrives in UK". BBC News. 16 October 2009. Archived from the original on 16 October 2009. Retrieved 16 October 2009. ^ Wheeler, Brian (16 October 2009). "Wilders' world of protest and publicity". BBC News. Archived from the original on 19 October 2009. Retrieved 16 October 2009. ^ a b Davis, Margaret (16 October 2009). "UK protests confront Dutch far-right MP". The Independent. UK. Archived from the original on 5 November 2009. Retrieved 18 June 2010. ^ "Geert Wilders Speech to the House of Lords". Avideditor.wordpress.com. 1 April 2010. Archived from the original on 9 April 2010. Retrieved 18 June 2010. ^ "Geert Wilders at the House of Lords". Dianawest.net. 5 March 2010. Archived from the original on 8 March 2010. Retrieved 18 June 2010. ^ "Dutch anti-Islam film to be shown in London". Expatica.com. Archived from the original on 2 February 2010. Retrieved 18 June 2010. ^ Waterfield, Bruno (2 February 2010). "Geert Wilders to test British free speech with anti-Muslim film screening – Geert Wilders, the radical anti-Muslim Dutch politician, will seek to test free speech in Britain next month when he makes a second attempt to visit the House of Lords to screen a controversial film equating Islam to Nazism". The Daily Telegraph. UK. Archived from the original on 5 February 2010. Retrieved 18 June 2010. ^ van Teeffelen, Gert-Jan (5 March 2010). "Wilders schokt pers in Londen". De Volkskrant (in Dutch). Archived from the original on 8 March 2010. Retrieved 11 March 2010. ^ Geplaatst door Dutch Politics (20 March 2010). "Balkenende Speaks Out Against Wilders". Dutchpoliticalreport.com. Archived from the original on 29 July 2012. Retrieved 18 June 2010. ^ "Verhagen: Wilders beschadigt reputatie Nederland". De Volkskrant (in Dutch). 10 March 2010. Archived from the original on 12 March 2010. Retrieved 11 March 2010. ^ "Wilders Damages Holland: FM". Islamonline.com. Archived from the original on 22 July 2011. Retrieved 17 February 2011. ^ "Wilders is damaging Holland: minister". Dutchnews.nl. 11 March 2010. Archived from the original on 14 March 2010. Retrieved 18 June 2010. ^ "Employers: Wilders damages Dutch interests". Rnw.nl. Archived from the original on 22 March 2010. Retrieved 18 June 2010. ^ "Wilders is bad for the Netherlands: employers". Dutchnews.nl. 13 March 2010. Archived from the original on 17 March 2010. Retrieved 18 June 2010. ^ Kölnische Rundschau. "Wilders in der Eifel nicht willkommen". Rundschau-online.de. Archived from the original on 29 September 2011. Retrieved 18 June 2010. ^ "Bürgermeisterin: Geert Wilders ist in Monschau unerwünscht". Az-web.de. 15 March 2010. Archived from the original on 27 July 2011. Retrieved 18 June 2010. ^ "Bürgermeisterin: Geert Wilders ist in Monschau unerwünscht". An-online.de. Archived from the original on 18 July 2011. Retrieved 18 June 2010. ^ "Demo for Geert Wilders on 17 April in Berlin". Pi-news.org. Archived from the original on 19 June 2010. Retrieved 18 June 2010. ^ "Dutch anti-Islam MP Geert Wilders rallies German Pegida protesters". The Daily Telegraph. 14 April 2015. Archived from the original on 26 January 2016. Retrieved 17 February 2016. ^ "Wilders sets up international alliance against Islam". Rnw.nl. Archived from the original on 8 June 2011. Retrieved 16 January 2011. ^ "Dutch Politician Plans on Global Spread of Anti-Islam Party". Pattayadailynews.com. Archived from the original on 24 September 2010. Retrieved 16 January 2011. ^ "Dutch Politician Forms Anti-Islam Coalition". News.sky.com. Archived from the original on 19 July 2010. Retrieved 16 January 2011. ^ "Dutch politician to form international anti-Muslim Coalition". Digitaljournal.com. Archived from the original on 19 September 2010. Retrieved 16 January 2011. ^ Geert Wilders's International Freedom Alliance!. "Geert Wilders's International Freedom Alliance!". Jihadwatch.org. Archived from the original on 20 July 2010. Retrieved 16 January 2011. ^ The Hill: Gingrich not to address 9/11 rally against mosque project as had been advertised. Archived 2017-09-01 at the Wayback Machine 21 August 2010. ^ "Wilders to speak at New York mosque protest". Dutchnews.nl. 6 August 2010. Archived from the original on 28 August 2010. Retrieved 16 January 2011. ^ "Wilders to join Ground Zero mosque protest". Rnw.nl. Archived from the original on 19 August 2010. Retrieved 16 January 2001. ^ "BREAKING: Geert Wilders to speak NYC- SIOA mega-mosque protest on 9–11". Nomosquesatgroundzero.wordpress.com. 6 August 2010. Archived from the original on 7 December 2010. Retrieved 16 January 2011. ^ Josh Marshall (11 September 2010). "Geert Wilders headline speaker at protest in NY City". Talkingpointsmemo.com. Archived from the original on 13 November 2010. Retrieved 16 January 2011. ^ "Wilders: I'll decide whether I visit Ground Zero". Rnw.nl. Archived from the original on 16 October 2010. Retrieved 16 January 2011. ^ "Protest at Wilders' speech". Dutchnews.nl. 9 August 2010. Archived from the original on 16 August 2010. Retrieved 16 January 2011. ^ "De Hoop Scheffer advises Wilders not to speak". Dutchnews.nl. 10 August 2010. Archived from the original on 18 August 2010. Retrieved 16 January 2011. ^ "Verhagen waarschuwt Wilders voor speech Ground Zero" (in Dutch). Elsevier.nl. 12 January 2011. Archived from the original on 11 June 2011. Retrieved 16 January 2011. ^ "Explaining Geert Wilders abroad". Rnw.nl. Archived from the original on 8 June 2011. Retrieved 16 January 2011. ^ "Dutch Diplomats Get 'Geert Wilders Lessons' – Publieksdiplomatie kabinetsformatie voor buitenlandse partners". Sylvanaknaap.blogspot.com. 11 August 2010. Archived from the original on 8 July 2011. Retrieved 16 January 2011. ^ "Tennessee Freedom Coalition To Host". Tnfreedomcoalition.org. Retrieved 31 May 2011. ^ "Police: Men killed in Garland shooting had assault rifles, body armor". dallasnews.com. Archived from the original on 5 May 2015. Retrieved 6 January 2019. ^ Stack, Liam. "Gunmen Killed After Firing on Anti-Islamist Group's Event in Texas". New York Times. Retrieved 4 May 2015. ^ "Aangiftes tegen Wilders stromen binnen". Elsevier (in Dutch). 15 November 2007. Archived from the original on 5 October 2008. Retrieved 15 March 2009. ^ a b "Dutch React to Prosecution of Wilders". Angus Reid Global Monitor. 3 February 2009. Archived from the original on 5 February 2009. Retrieved 15 March 2009. ^ a b Mock, Vanessa (22 January 2009). "Dutch MP to be tried for views on Islam – Party leader who made film linking Koran to Nazism accused of inciting race hate". The Independent. UK. Archived from the original on 10 November 2010. Retrieved 18 June 2010. ^ "Will Obama Stand With Geert Wilders?". Canadafreepress.com. Archived from the original on 26 May 2011. Retrieved 31 May 2011. ^ "Donate to The Legal Project". Meforum.org. 27 April 1998. Archived from the original on 6 June 2011. Retrieved 18 January 2011. ^ "Uproar for PVV". DAG (in Dutch). 25 January 2009. Archived from the original on 4 February 2009. Retrieved 15 March 2009. ^ "Court orders Wilders re-trial". The Irish Times. 22 October 2010. Archived from the original on 1 March 2011. Retrieved 31 May 2011. ^ "Dutch MP Geert Wilders back in court over 'hate speech'". BBC. 7 February 2011. Archived from the original on 22 March 2011. Retrieved 31 May 2011. ^ "Dutch Court Acquits Lawmaker of Hate Speech, Discrimination Against Muslims". Fox News. 23 June 2011. Archived from the original on 24 June 2011. Retrieved 23 June 2011. ^ "Dutch far-right leader Geert Wilders goes on trial for inciting hatred". The Guardian. Reuters. 18 March 2016. Archived from the original on 21 June 2016. Retrieved 28 June 2016. ^ "Geert Wilders faces possible €5,000 fine for hate speech". The Guardian. 17 November 2016. Archived from the original on 23 November 2016. Retrieved 24 November 2016. ^ "Geert Wilders shows 'Fitna' film in Rome, receives Oriana Fallaci free speech award". Euro-Islam.info. 20 February 2009. Retrieved 17 February 2016. ^ "Wilders nominated for free speech prize". rnw.org. Retrieved 17 February 2016. ^ "Wilders wins tv show's politician of the year award". DutchNews.nl. 14 December 2010. Retrieved 15 December 2015. ^ "Wilders door publiek verkozen tot politicus van het jaar". nrc.nl (in Dutch). 16 December 2013. Retrieved 15 December 2015. ^ "Geert Wilders voted Netherlands Politician of the Year". The Netherlands Times. 15 December 2015. Retrieved 15 December 2015. ^ "Geert Wilders named Dutch politician of the year". dailystar.com. 19 December 2016. Retrieved 22 December 2016.